Phil Cox conferred with Governor Chris Christie. WASHINGTON — Growing up in Hingham, with a self-described “idyllic childhood” where his Dalmatian followed him on the walk to school, Phil Cox was far more concerned with his hockey game than with politics. His senior year at Hingham High School, he was the left wing on the state championship hockey team. Many say he is still deserving of the Mr. Hustle Award. Cox, who grew up in one of the most liberal states in the country, is wrapping up his tenure as executive director of the Republican Governors Association. He oversaw a hugely successful election cycle where Republicans held onto competitive seats in Wisconsin, Florida, and Maine, while winning new seats in states like Massachusetts, Maryland, and Illinois. Cox, 40, is credited with much of the success, and is now expected to be perhaps the most sought-after adviser in a crowded Republican field of 2016 presidential candidates. Cox also made a deep connection — over both sports and politics — with New Jersey Governor Chris Christie, who was chairman of the RGA and is considering a presidential run. Cox, the youngest of three, grew up in the Liberty Pole neighborhood of Hingham, going to public schools and playing baseball, golf, and hockey. Growing up, his mother, Phyllis — a social worker who worked for hospice care — leaned Democratic. His father, Jim — a longtime pediatrician at South Shore Medical Center — was a Republican. He remembers, as a 10-year-old, watching the 1984 conventions gavel to gavel on television. He was interested in politics, and history, but wasn’t particularly active otherwise. Just after graduating from the University of Virginia, he managed a local race for Paul Harris, who in 1997 became the first black Republican elected to the Virginia House of Delegates since Reconstruction. In 1999, he started a consulting business and had 23 clients. He won 22 out of 23 races. By 2006, he was second in command at Americans for Prosperity, the conservative political advocacy group funded by the Koch brothers. He ran Bob McDonnell’s gubernatorial campaign and then joined the RGA, first under Mississippi Governor Haley Barbour and then under Texas Governor Rick Perry, McDonnell, Louisiana Governor Bobby Jindal, and Christie. It’s a role that many governors have used to elevate their national platform, making more connections, raising money, and paving the way for higher office. Cox and Christie saw eye to eye on many of the organization’s strategic decisions, recruiting candidates to run and spending heavily on those they backed. They made a decision to invest early in New Mexico, South Carolina, and Iowa — all states with Republican governors that at one point could have become competitive. Cox had a particularly strong role in recruiting Charlie Baker to run in Massachusetts. Baker had initially called Cox in 2009, asking him if he would run his first gubernatorial race. Cox, who was in the homestretch of a campaign he was running in Virginia for McDonnell, declined. But a few years later, Cox was the one recruiting Baker. Cox said he had a brief phone call with former US senator Scott Brown — “it was very clear to me that he wasn’t serious about it” — but he thought Baker was their best shot. By September, Christie said, he wanted to invest in Maryland and Colorado by taking the RGA into debt. Cox was more cautious, but he came around. Cox (a diehard Red Sox fan who can still name every player from the 1986 team) and Christie (a diehard Mets fan who relished rubbing in the 1986 World Series outcome) bonded over baseball. One day a few weeks ago, Christie went to his office and had a FedEx package from Cox. Inside was an photo of the 1986 Mets celebrating on the field. It was autographed by all of the players. Christie didn’t let on whether Cox would be on his own short list. And Cox says he’s still trying to decompress from the last campaign. “For a guy like me, running a presidential race is the equivalent of climbing Mount Everest,” Cox said. He might not have too long to weigh them. 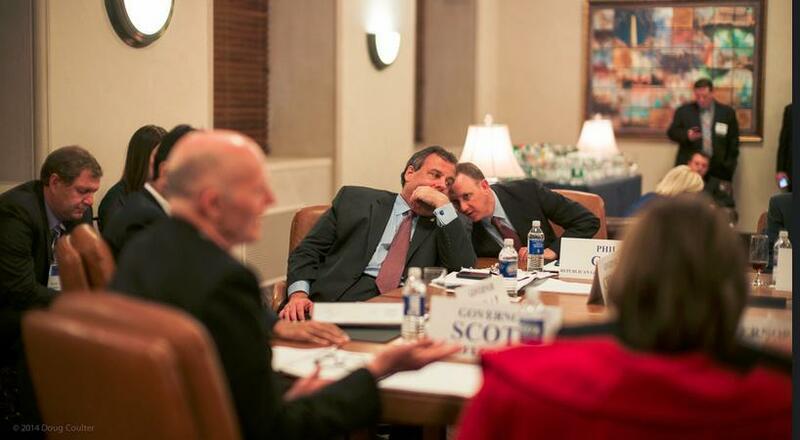 Presidential candidates, including Christie, are starting to gear up.